Early Wednesday morning, the moment finally arrived: The 2016 election results were announced. Donald Trump became the president-elect, defeating Democratic nominee Hillary Clinton. Along with his Republican running mate Mike Pence, Trump gave his victory speech to a full crowd. As he spoke to America, his entire family stood on stage alongside him. Of course, that included his wife, Melania Trump. 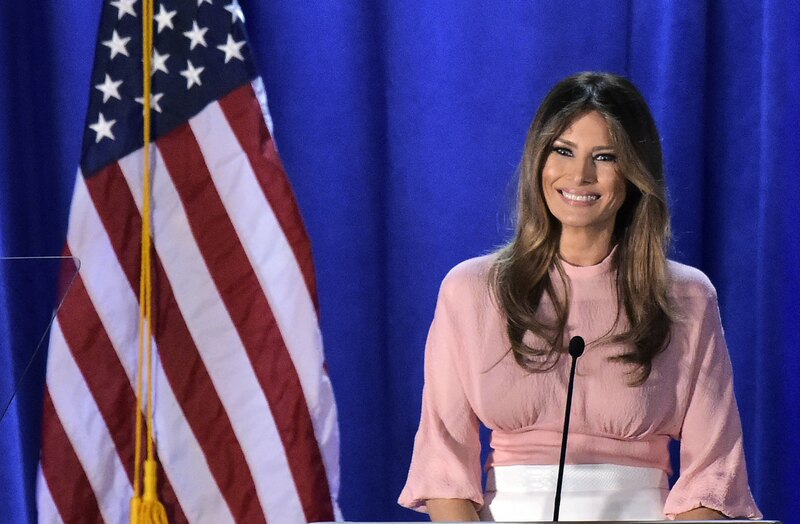 So, how did Melania react to the Donald's win? While she didn't jump up to the mic and speak, she seemed to stand proudly on the stage, occasionally flashing a smile. She also followed Trump as he walked through the crowd with their son, Barron. But because her facial expressions varied between serious and smiley, people on Twitter began to question the future First Lady's excitement. With messages ranging from, "[M]elania is very obviously not happy and faking a smile" to "reasonable to think they are tired, of course, and overwhelmed, but [D]onald and [M]elania [T]rump look mortified," the skepticism was apparent. I think it's a stretch to say she was unhappy, but if she was tired or serious, it would make sense, given what a long day it was. Either way, not everyone was buying her reaction. It is true that she wasn't grinning the entire time. But remember that whole thing about not forcing women to smile? Totally applies here. To Melania and Don and Ivanka and Eric and Tiffany and Barron, I love you and I thank you. And especially for putting up with all of those hours. This was tough. Regardless, Trump is right — there's no denying that Melania was there through it all. And I'm sure it's only a matter of time before she posts a celebratory tweet.